In a bid to its commitment to stay strong against the day by day increasing propaganda of the western media and the US based Think-Tanks against Chinese government using civil, religious, human and cultural rights as their key tools, the Chinese government and the Chinese media as part of their policy are determined not to pay back the US and their western allies in the same fake coin. On the contrary, Chinese government has devised a multipronged policy of engagement through diplomatic channels and communities as a part of people to people contact. This has proven as the most effective mean to convince the critics or at least those who had concerns due to being unaware of the actual situation and un-willful negligence. At the same time, Chinese government as a policy paid more focus on the socio-economic wellbeing and uplift of the most talked about province Xinjiang and especially its Muslim inhabitants. Giving priority to the people of Xinjiang and the Muslim community over there, China has devised the policy to ensure "stability, development, harmony" and to fight ethnic separatists and to mainstream the Muslim population. Many incidents are reported in the western media to tarnish China’s image in the world with respect to social and ethnic imbalances. Since, China announced One-Belt-One-Road initiative in 2013 and termed China-Pakistan Economic Corridor (CPEC) as its flagship project in 2015, the US media and the western outlets have been getting more aggressive. The media policy toward China sounds only to highlight negativities and exploit even smallest incident, which happen on individual level where the state has no role as a part of its policy. Such incidents are reported not only in exaggerated manner but the facts are badly distorted and even some time changed. Having realized the mal-affects of these negative reports and to coupe with the challenge, Chinese government decided to pursue on this front in a more aggressive yet sensible manner. To shun the propaganda and to expose these rumor mills and propaganda factories, China started an altogether new way of engaging with the media personals directly and it also started inviting delegates of diplomats and intellectuals from across the world allowing them to witness the state of affairs with naked eyes and report them freely and independently. Apart from that, it happened quite a lot of time that China as a part of its diplomacy started inviting the delegates and human rights organizations from across the world to visit Xinjiang, one of the mostly talked about provinces which populates more Muslims than they live in the rest of its provinces and sates. Special focus was made to call upon the delegates and intelligentsia from the Muslim World to eyewitness the situation by way of interacting with the Muslims of Xinjiang and get direct testimonials from the followers of Islam. It is not at all exaggeration to make the point that today’s China is most accessible and its people are more reachable than they had been in the past. Most recently, as reported by the China Daily on 2 February 2019, a media delegation from Egypt who visited Xinjiang for a week starting on Jan 25 at the invitation of the State Council Information Office and the Chinese Embassy in Egypt, “spoke highly of the stability, development and work against extremism in the Xinjiang Uygur autonomous region after visiting the area”. The report further states that the delegation was able to talk to residents and students at vocational training centers in Xinjiang province. The report says that the delegations noted China's experience in effectively combating terrorism and extremism through addressing both its symptoms and root causes. “During a visit to a newly opened night market in Hotan, Adel Ali, a senior editor and researcher for Egypt's State Information Service, found that the development of tourism in Xinjiang had helped improve people's lives and reinforced social stability”, notices the report. This is pertinent to note and the China Daily clearly narrates that during the year 2018, “Xinjiang hosted more than 150 million tourists, up 40 percent year-on-year. The report presents some interesting findings that in a village of Shufu county, Egyptian group witnessed Rehman Abdulla making a traditional music instrument called a dutar. His sons were playing music on their own instruments. “Through traditional music and dance, people can display their distinctive culture and share their joy with others," said Lamiaa Ramadan of Nile TV. "It is the efforts of the Chinese government that have enabled the diverse culture in Xinjiang to be passed down." The recently published report also brings forth some interesting facts related to the religious freedom as opposed to the western propaganda. The report provides a strong testimonial by the visiting delegates who clearly state, “the in houses of worship such as the Id Kah Mosque in Kashgar, modern facilities abound, providing water, electricity and air conditioning. Local clerics told the visitors that their religious activities had been very well protected”. "The conditions here are very good," said Abdelhalim Elwerdany, of Egypt's Al-Gomhuria newspaper. "I could feel that local Muslims fully enjoy religious freedom." The China Daily in the same article pointed out that after visiting the Xinjiang Islamic Institute Kamal Gaballa, a columnist for Al-Ahram newspaper, said. "The government has created a very good environment for the clerics. "In the past, southern Xinjiang was home to many impoverished people, and some residents had poor language ability and lacked the skills to find jobs, which may have contributed to terrorism and extremism. Last year, Xinjiang poured 33.4 billion yuan ($4.98 billion) into anti-poverty efforts to help people live better lives. Most of the money, more than 92 percent, was channeled to southern Xinjiang. That said, the report quotes some of the delegates who got immensely inspired by the Chinese government’s policy to offer equal opportunities to the Muslims of China. The delegates from the Egypt as pointed out in the report, visited a garment factory in Shule county, which employs more than 200 local people, including Arizgul Nurmemet. Arizgul has been working in the factory for more than a year, and makes more than 3,000 yuan a month. "In Egypt, farmers must go to cities to find jobs if they want to increase their income," Elwerdany said. "This factory in a rural area is a good example for us to learn from, so that farmers can get rid of poverty without leaving their hometown. "Nermin Khalil, a senior TV announcer in Egypt, bought clothes for her children at the factory. She said that the factory had truly improved local people's livelihoods. "Poverty and ignorance are a hotbed of extreme thoughts, and if people can live good lives, extremism will certainly disappear," she said. The China Daily states that Xinjiang has been promoting preschool education in recent years, with modern kindergartens built in many villages in Kashgar and Hotan. At one in Hotan, children were dancing with their teacher. The classroom has a full range of modern facilities, and the beds were clean and tidy. "Education can shield people from the impact of extremism," said Lamiaa Ramadan. Meanwhile, Xinjiang has provided lots of job opportunities thanks to its cross-border trade. Maher Maklad of Al-Ahram newspaper said stability was the key to continued economic growth. "That's true for any locality in the world," Maklad said. Vocational training centers provide language, law and skills courses. They also help eliminate extremism and prevent people who have committed minor criminal acts from falling victim to terrorism and extremism. At a center in Hotan, trainees can choose cooking, vehicle repair or hairdressing classes. 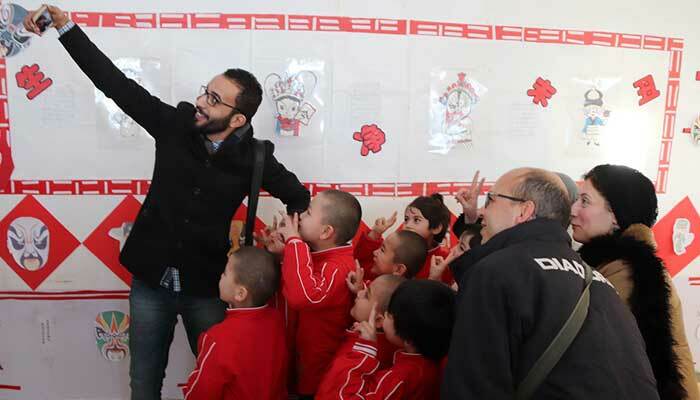 "I found that the training centers are completely unlike the reports of some Western media, which said they mistreated learners," said Kamal Gaballa, who visited several training centers in places such as Hotan and Kashgar. Trainees study language and law, and learn how to treat others kindly. This great measure is an effective means to get rid of extremism. I will explain all of what I see here truthfully to the Egyptian people." Villager Nurmemet Tursun has just finished his training at the center. Relying on the noodle-making skills he acquired there, he opened a vegetable and noodle shop. His family lives a much better life than before. "My camera captured the smiling faces of many trainees," said Hamdi Emam, a cameraman for Nile TV. "They understand that the training is to help themselves."